This article contains highlights from a series of three Orioles (interactive online tutorial notebooks) on probabilistic programming from scratch. In the Orioles, Mike Lee Williams explains both the mathematical background and the Python code more deeply, and delves into a variety of real-world statistical problems. Real-world data is almost always incomplete or innaccurate in some way. This means that the uncertain conclusions we draw from it are only meaningful if we can answer the question: how uncertain? One way to do this is using Bayesian inference. But, while Bayesian inference is conceptually simple, it can be analytically and computationally difficult in practice. Probabilistic programming is a paradigm that abstracts away some of this complexity. There are many probabilistic programming systems. Perhaps the most advanced is Stan, and the most accessible to non-statistician programmers is PyMC3. At Fast Forward Labs, we recently shared with our clients a detailed report on the technology and uses of probabilistic programming in startups and enterprises. But in this article, rather than use either of these advanced comprehensive systems, we're going to build our own extremely simple system from scratch. We'll write clear, functional Python 3. We'll use generators to build up a pipeline that will allow us to answer concrete questions. We won't use any libraries (except for random number generation and plotting). And I'll go easy on the mathematics. The code will be slow compared to Stan and PyMC3, but hopefully you'll understand every line. This "from scratch" approach follows in the footsteps of Joel Grus's book Data Science from Scratch, and Jake VanderPlas's PyCon talk Statistics for Hackers. I recommend both. In his talk, Jake said, "if you can write a for loop, you can do statistical analysis." That isn't always true (good luck implementing ADVI with a for loop). But when it is true, we can focus on the big, fundamental ideas without getting lost in algebraic or computational details. Let's take a specific data analysis problem: a simple A/B test for a website. Suppose our site has two layouts. During our test, 4% of visitors to layout A convert (i.e., buy something, sign up for the mailing list, whatever), and 5% to layout B convert. Clearly, layout B is better, so we should use that layout, right? But what if I tell you it was a very small test? Are you still sure B is better? And what if it's going to cost us $1 million to change the layout if we get this decsion wrong. Are you sure enough? If not, how much more data would you need? To answer these questions, we need to quantify exactly how confident we are that layout B is better, given the slice of data we do have. This function turns the prior distribution into the posterior. What does that mean? I talk about these distributions in more detail in the Orioles, but for this article, the rough idea is sufficient: samples from the prior distribution are our best guesses of the values of the unknown parameter of our system. In the case of an A/B test, this is the conversion fraction of a layout. These guesses are made before we do the experiment. 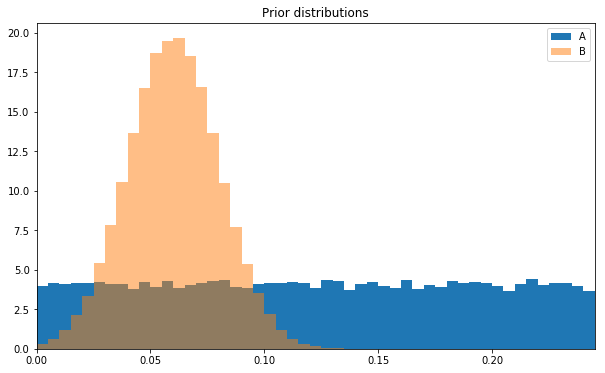 Samples from the posterior distribution, meanwhile, are guesses of the same parameters made after the experiment, in the light of the data we gathered. Once you have the posterior, you can answer concrete questions about the implications of the data, such as how likely it is that layout B is better, given our data. In the function above, the prior_sampler argument is a generator that yields samples from the prior. We run the function simulate on a single sample from the prior. This simulates the experiment, assuming the prior sample is correct. We then compare the simulated outcome to the real outcome (data). If these agree, the sample from the prior can be used as a sample from the posterior. If not, we try again with another sample from the prior, until they do agree. After we run a lot of simulations using a lot of samples from the prior, we'll have a good idea of which values were most likely to produce the observations we in fact saw, and are therefore most likely to be correct. And that's the whole algorithm. Abstracted away in that little posterior_sampler generator function, it's an extremely lightweight probabilistic programming system. Effectively, this function runs a fake A/B test in which we already know the conversion fraction. Here's how it works. The random function returns a random floating point number between 0 and 1. That number will be smaller than p with probability equal to p. We use a generator expression to do this n_visitors times. outcomes is then an iterable of booleans, True if that trial was a success (i.e., the ith visitor converted) and False if not. Finally, we take advantage of the fact that the sum of an iterable of booleans is equal to the number of True elements it contains. We use a generator comprehension in this function because n_visitors could potentially be very large, and we want to do these calculations lazily and avoid holding the outcome for each visitor in memory simultaneously. (If Python generators are new to you, I recommend you watch or read Ned Batchelder's fantastic PyCon 2013 talk, "How To Loop Like a Native" for an introduction. If you're not using generators, you're not using the full power of Python. I talk about them much more in the Orioles. Let's write a quick take function that will allow us to peek at a few samples from this generator. "Return first n items of the iterable as a list." These are three guesses for the unknown conversion fraction of layout A. They are all around 4% percent. That's consistent with the fact that we had four conversions from 100 visitors. But note they are not exactly 4%. 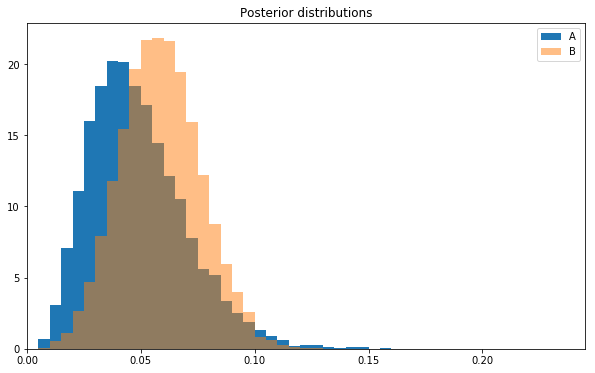 We can build up a picture of their distribution by getting thousands of samples from posterior_sampler and plotting a histogram. This is the posterior distribution for the conversion fraction of layout A. It's a full picture of our knowledge after the experiment. Again, we're using the fact that the sum of an iterable of booleans is equal the number of true elements. This tells us there's a 2% chance layout A's conversion fraction is greater than 10% (or equivalently, we can be 98% certain it's less than 10%). To complete the A/B test, however, we also need the posterior for layout B. Mathematically, this function samples from a normal distribution with a known mean and standard deviation, and support in the interval (0, 1). 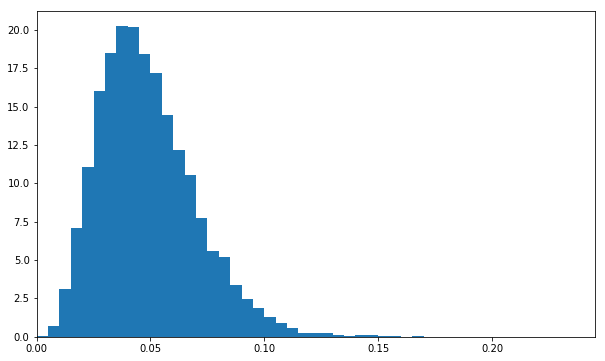 Conceptually, though, it's easier to plot a histogram, and compare this prior to the uniform prior we used for layout A. The guesses for layout B are concentrated around 6%, which captures our prior knowledge. Now that we have the prior sampler for layout B, we can make its posterior sampler and take some samples. Let's visualize the two sets of posterior samples directly. Note the histogram for layout B is to the right of that for layout A. This is telling us that layout B is probably better than layout A. And we're finally in a position to answer the original question: how confident can we be that layout B is better? In this simple case, we can do this by making pairwise comparisons between the two lists of estimates and measuring the fraction of pairs for which the estimated conversion fraction of B is bigger than that for A. And that's it! Given the data and our prior beliefs, we are 66% sure that layout B is better than A. If a mistake is going to cost us $1 million, this probably isn't confident enough. We need to run a bigger A/B test before making this business decision. If we collect more data, however, we'll quickly run into one of the limitations of ABC: it's slow. Change the data and rerun this code to see for yourself. Approximate Bayesian Computation is indeed slow and in some ways crude. There are often better options. But it's not cheating. In the Orioles, I show how to speed it up for more realistic problems. This article hopefully helped you to form a mental model of the relationship between the prior and the posterior distributions. This should leave you in good shape to look deeper into probabilistic programming and inference. Article image: Dice roll. (source: Pixabay).